Anime Studio Debut is Smith Micro's homegrown animated answer to their translated 2D art program, Manga Studio. It uses a "bone" interface as its core. You use a tool to add bones to the structure of a drawing. You can then animate these bones, and you can adjust their strength to behave more like real bones. Anime Studio Debut ($50, 30-day free trial) can also animate based on edges of drawings and in many other ways. It includes a straightforward timeline system that allows you to intuit when and how animation happens easily. Build animated characters from the skeleton up with Anime Studio Debut. Underneath the animation is a full-featured paint program that has a familiar look to it, as it appears inspired by Manga Studio. One of the best things about Anime Studio Debut is its well-designed tutorial PDF. This tutorial, which is laid out like a design book, goes from simple to complex in numerous tutorial topics. Anyone wanting to master Anime Studio Debut would be best served by running through this tutorial from beginning to end. The tutorials are detailed and involved, so expect that to take several hours. Anime Studio Debut doesn't have the capability for 3D animation; it's strictly designed for making 2D art move. That isn't necessarily a bad thing, as for the most part, anime is still entirely 2D. The 3D graphics invasion has not taken hold of anime in a major way like it did Western animation. Anime Studio Debut's sister program Manga Studio (available in beginner Debut and professional EX versions) has widespread popularity in the comics industry. The same cannot be said of Anime Studio Debut in the animation industry. 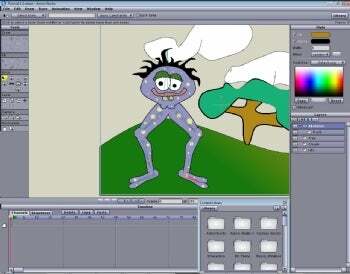 The majority of professionals in animation use programs like Flash and 3D Studio Max, with a few exceptions. So Anime Studio Debut isn't really a route into professional work, but it is an easy to use and inexpensive introductory animation application. Anime Studio Debut also includes a rudimentary lip-synching utility, which approximates based on tones. It's not nearly as advanced as the feature included with the full-featured Pro version. Note: Anime Studio Debut is the introductory version of the program and costs $50. The Pro version, which includes 3D support, output in high definition, and advanced lip synching, costs $200.